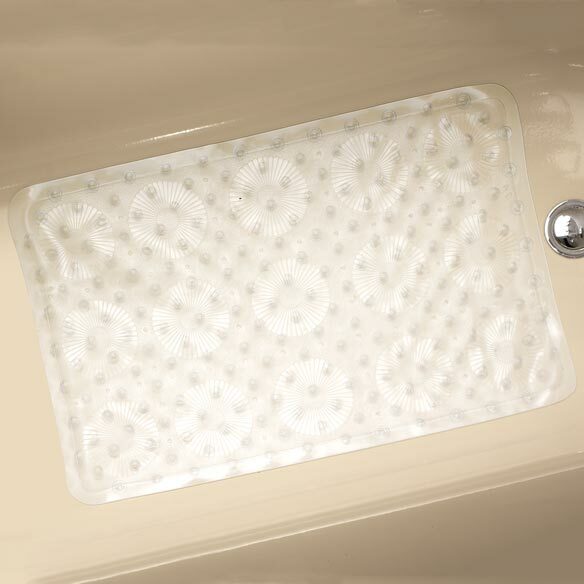 Non slip bath mat with suction cup grips stay put! 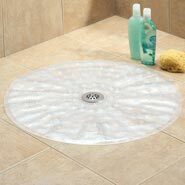 Clear bath mat with drain holes has textured, nonslip surface to stand on safely; treated to protect against mold, mildew, bacteria. Clean in the washing machine! Bath Mat is 17 1/2 x 28". Having surgery soon, don't want to slip and fall in tub. I need it in the tub so I won't slip down when I shower and wash my hair. Conditioner and shampoo make the tile slippery. I need a mat in my walk in tub. It need to be small, I have to cut holes for the jets and I hope this one will work. They need to make mats for walk in tubs. I haven't found any yet. we need one and I don't got out shopping. much. My current bath mat always looks dirty even though it's been washed. "Need to replace with a safer mat. Reasonable price"
It just fits along with my regular bath mat in the shower. My husband is afraid of falling and this made him feel much safer. However, I use it with another invaluable aid that I can leave in the shower - Easy Comfort's Uprise Folding Walker XL. need a new bath mat for my husband as he finds the current shower slippery. This was to help my mother with showering but it did not work well for her. It did not cling to floor well enough to keep her from slipping.